A novelty at Mineralexpo (Barcelona) 2013. 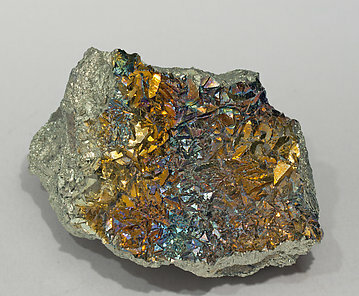 A druse, on matrix, of cubo-octahedral crystals with a superficial iridescent patina with dominant deep metallic yellow and blue shades and a very intense luster. A novelty at Mineralexpo (Barcelona) 2013. 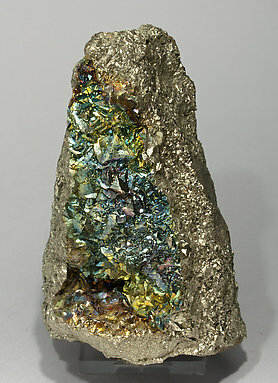 A druse, on matrix, of extraordinarily bright cubo-octahedral crystals with a superficial iridescent patina with deep metallic blue and yellow shades. 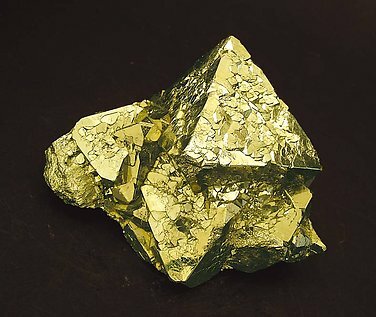 Group of octahedral crystals with very bright and very well defined faces and edges, rich in accessory faces and polycrystalline growths on some of the octahedral faces. Great brilliance and lots of color. 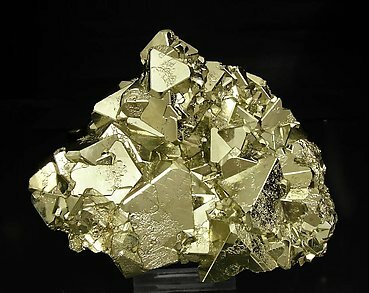 I like the shape and I also like the fact that, while it is metallic, it does not look heavy. Great brilliance and complex crystallography, with multiple combinations of cubes and octahedrons. It is a floater and as good as the photo suggests. 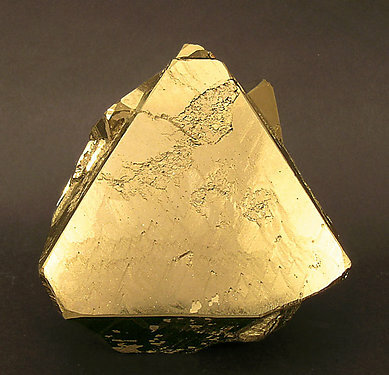 Note the curious forms of the octahedral growth patterns that are present on all the front faces of the Pyrite.